EmailSender does not propagate metadata. EmailSender has no metadata templates. Metadata of the first output port are the same as those of the input port. However, metadata are not propagated from the input port to the first output port. Metadata of the second output port have the same fields as metadata of the input port plus one field named errorMessage. This field receives the information about the error that has occurred. SMTP user The name of the user for an authenticated SMTP server. SMTP password A password of the user for an authenticated SMTP server. A set of properties defining the message headers and body. For more information, see Email Message. A set of properties defining the message attachments. For more information, see Email Attachments. By default, invalid SMTP server certificates are not accepted. If set to true, an invalid SMTP server certificate (with different name, expired, etc) is accepted. By default, when an email is not successfully sent, the graph fails. If set to true, the graph execution continues even if no mail can be sent successfully. EmailSender converts data records into emails. It can use input data to create the email sender and addressee, email subject, message body, and attachment(s). If no input edge is connected, this component sends one email. If a record is rejected and an email is not sent, an error message is created and sent to the errorMessage field of metadata on the output 1 (if it contains such a field). In this wizard, you specify a content of particular parts of an email message: drag and drop the proper field from the Fields pane to the Value column. You can also specify values to be used if the mapped field is empty. The alternative values of these attributes should be typed to the Alternative column. If a field is empty or has null value, Alternative is used instead of the field value. You can add additional headers using the plus button. This way, you set up Cc or Bcc. To send an email to multiple recipients, separate their addresses by a comma ','. If needed, use the same delimiter in the Cc and Bcc fields. Each field in the Properties table can be used as a template. Variable names are substituted with values from record. For example, the MessageBody field contains Hello, my name is $name. and the name field in input record contains the value Bob. The output message will contain the text Hello, my name is Bob. 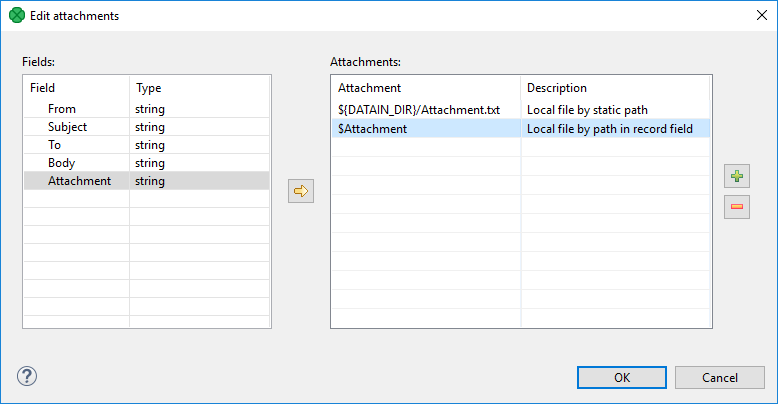 The Attachments attribute lets you add files as an email attachment. 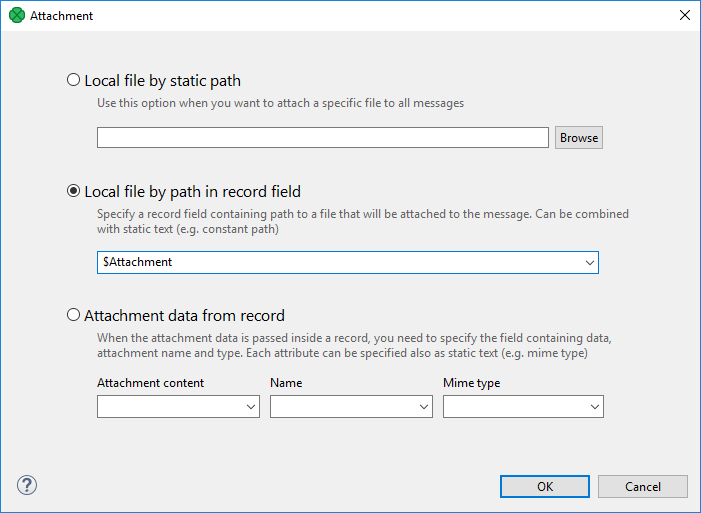 The attachment can be a file with invariable path (static file), a file whose name is received from an edge or a file whose content is received from an edge. These ways can be arbitrarily combined. The attachment is specified as a sequence of individual attachments separated by a semicolon. It is defined as a field name (file name received from an edge), as a file name including its path or as a triplet of field name, file name of the attachment and its mime type. Each of these three parts of the triplet can be also specified using a static expression. You add the items by clicking the Plus sign button and remove by clicking the Minus sign button. Input fields can be dragged to the Attachment column of the Attachments pane or the Arrow button can be used. In this wizard, you need to locate files, specify them using field names or the mentioned triplet. After clicking OK, the attachment is defined. If you want to use non-ASCII characters in filenames of attachments, value of the system property mail.mime.encodefilename needs to be set to true. Any non-ASCII characters in the filenames will be encoded then (default is false). Default MIME charset to use for encoded words and text parts that don't otherwise specify a charset (not only filename, but subject, message body as well) can be specified using the mail.mime.charset system property. The default value is the value of the file.encoding system property. The EmailSender component is implemented using the JavaMail reference implementation library. JavaMail specification lists Java system properties which control behavior of the JavaMail implementation. For description of these properties, see the JavaMail API documentation. Use -D Java VM parameter to set the value of a system property. Metadata of EmailSender can have list and map fields. The map and list fields can be passed through, but they are not suitable for use in the component.